"The Ereyn Chronicles: Part I..."
You've got to hand it to Hugues Lefebrve (aka Hugo) for compositing such a technically accomplished, musically vibrant, and melodically memorable album. 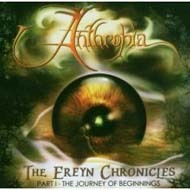 Although the 24-year old Frenchman enlisted the help of the odd guest musician and drummer Damien Rainaud, ANTHROPIA's "The Ereyn Chronicles: Part I – The Journey of the Beginnings" is his baby. 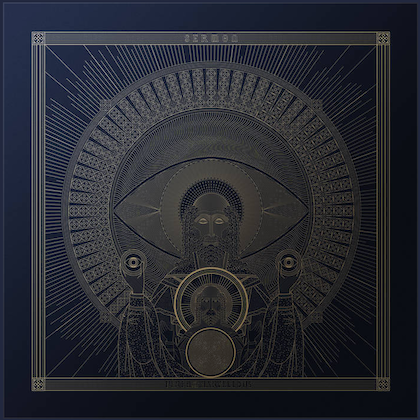 With a very involved fantasy concept involving, among other characters, dwarves, dragons, and witches, the album is an impressive blend of progressive and traditional metal held together by weighty strands of classical composition. The story itself is quite involved, so I'll leave to you the task of discovering the rich tale. 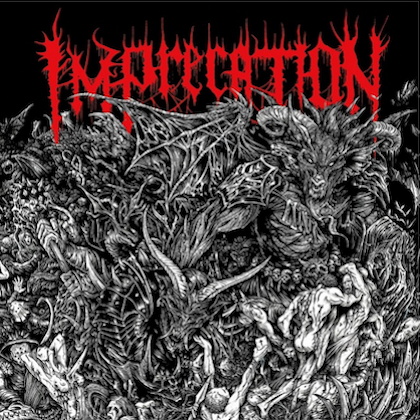 At 64-minutes, the experience is not nearly as daunting as it may seem, as both individual tracks are smartly assembled in a way that allows melody to stand shoulder to shoulder with the blazing riffs. By the same token, the album flows very well; some degree of attention is required, but not so much as to render the exercise a painstaking one. Arrangement twists are of course present, but not disjointed or disruptive to the songs' overall appeal. After an appropriate mix of operatic vocals that build to heavy riffing/drumming on opener "Welcome to Eden", the realization that the guitar plays a central role becomes immediately apparent on the mostly up-tempo "Question of Honour". Hugo is quite the power shredder, his solos and riffs very strong, yet not excessive. Along with the powerful six-string work, choir vocals (in addition to Hugo's mid-to-upper range prog/power vocals) and keyboard-created atmosphere is found on this track, as well as songs like the folk-peppered "Lords of a World" and the metallic bluster of the nine-minute "In the Maze of a Nightmare". The silky smooth vocals of Marie-Eve Orengo are heard on "Lion-Snake" in her role as the "The Witch". The narrated parts flow seamlessly as part of the song structures too, as demonstrated on the guitar-based and otherwise instrumental "Through the Sleeping Seaweed". Though primarily heavy on the riffs and driving rhythms, mood changes are found all along the way, the mellow and exceedingly tuneful "Forgotten" a case in point. Ten-minute album-closer "The Desert of Jewels" includes Hugo's interpretation of Antonio Lauro's "Venezuelan Waltz #3" for classic guitar. The tune itself is a most appropriate way to close the album, as it is serene and powerful at once. "The Ereyn Chronicles…" more than holds its own against similar proggy opuses, particularly the more metallic variety. The performance is flawless and the songwriting is generally strong. Perhaps not the epic album to end all epic albums, but a darn good listen just the same.